In life we are not always fortunate to be surrounded by our loved ones. I’m going to be separated with two people who are closest to me for nearly a year. My sister is on her way to the university of Pennsylvania for a course in non-profit leadership and my brother in law is off to INSEAD in Fontainebleau, near Paris for masters in business management. Although we don’t live in the same city, we would meet up at least 4 to 5 times in a year. And although I’m extremely happy for them (congratulations dearest folks) it is still taking me time to digest that I wont be seeing them for quite some time (I’m not yet brave enough to be traveling between countries with an infant son in tow). It was quite wonderful when we got together for my son’s naming ceremony at my parent’s place, with my baby boy being the star attraction. When it was time for my sister and brother in law to leave, I wanted to say good bye and wish them luck with a cake. If I were in Mumbai I would have made my sister’s favourite Pineapple cream cake. Since I didn’t have the ingredients on hand I decided to make a vanilla cake with chocolate frosting. This cake has fascinated me for long. A Chocolate frosting on a Chocolate cake is always great but when a Chocolate frosting is used on a Vanilla cake the flavours simply stand out! The characters of both the vanilla and the chocolate show their individual colours. I’m a great fan of anything “vanilla” and I was elated when this cake came out beautiful, as I had expected. This Vanilla cake is quite basic and can be served in a myriad ways. It has a perfect crumb, considering its eggless. I discovered that adding yogurt to the batter makes the cake tasty, light and spongy. Other than the cocoa butter frosting given below, it can be topped with Chocolate Ganache, Fresh Cream, various fruits and the like. Lately, I have been wondering what kind of an eater my little fellow is going to be and about his likes and dislikes. It might sound strange to a few but I have already started planning his birthday party menus. And I eagerly hope that Harivansh is going to enjoy and relish this cake as much as we do at home. The Vanilla cake can be used as a base recipe and topped with different kinds of frostings like Chocolate Ganache, Butter Cream and Fresh Cream frostings and Fresh fruits like pineapple, peach, strawberry, etc. Grease and line the bottom of a 9” round cake tin with greaseproof paper/baking parchment/butter paper. Preheat the oven at 150 degrees centigrade. In a mixing bowl, assemble the flour, baking powder and baking soda, mix with a spoon and sieve once to make the mixture uniform. In a bowl assemble the butter and the condensed milk and beat (with a hand mixer or a wire whisk) until the mixture is combined, about a couple of minutes. Mix in the yogurt and beat again. Pour in the milk and vanilla and beat until the mixture is well mixed. Stir in the flour mixture and mix with a spoon, whisk or the legs of the hand mixer before starting to beat again. This will prevent the flour from getting dispersed outside the mixing bowl. Beat until the mixture is uniform and smooth and there are no lumps. This shouldn’t take more than a couple of minutes with an electric hand mixer/beater. Be careful not to over beat as this tends to make the batter stiff which might result into a harder textured cake. Pour the batter into the cake tin and bake for an hour at 150 degree centigrade. With the help of a hand mixer or a wire whisk, mix the cocoa and butter. Stir in the powdered sugar, vanilla and hot water. 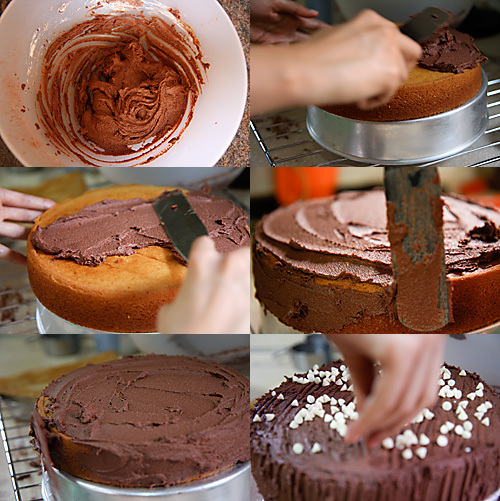 Beat until you get a smooth frosting which can be spread easily over the cake. Place the cake on a cooling rack and spread the icing, smoothening the top and sides with a palette knife. You can run a fork across the cake to make criss cross patterns. Frosting looks divine. And what amazing pics you have!! I too am a fan of vanilla and that cake sounds perfectly delicious! What can we do to make the cake slightly juicy? Is it possible with this cake? I guess the shelf life might not be longer if it is moist, but still thought of checking with you. Uma Aunty: Thanks. I'm happy you liked it. For a moist cake, the cake can be wet with a sugar syrup (boil 1 cup water with 4 tbsp sugar and cool) or any fruit juice. For instance if its a Pineapple cake, I like to moisten the cake with Pineapple juice. Anu, the cake looks wonderful, especially the frosting and the deco. 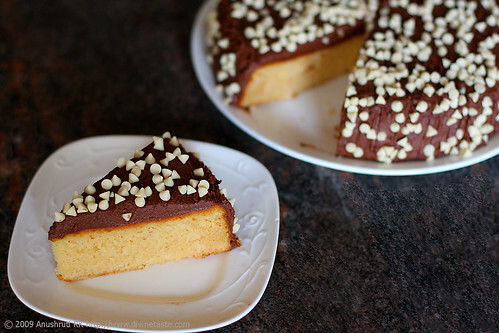 Moreover an eggless cake! Wow, good one! Hey Anu the cake looks absolutely sinful! I loved that its an eggless cake and the frosting looks divine, gorgeous clicks, by the way which camera are you using? nikon? What a beauty? the cake and your blog. The does seem divide Anu…wow! I am so used to making the Betty Crocker's instant cake mix in the US, that I never tried making at home from scratch. Now u have inspired me to do so and I cant wait to try. And lovely pics! My dear! You are such a good photographer! Such pleasure to watch the pictures:). Cake looks so yummy and well browned. I must keep these pics away from my daughter or I will be in trouble – haven't made one for ages now! An award is waiting for u at my blog…Congrats..
Parita: I use a Canon 40D and planning to add the 5D mark II to my collection. Sireesha: That's indeed very sweet of you. Thank you very much. Hey Anushruti, thanks for stopping by at my blog. 🙂 I am so happy to discover yours in return. Also happy that I finally found a recipe for eggless cake that looks soooo good. I have always been scared to try eggless stuff. But sometime, you've just got to make them for the friends who are off eggs. I totally agree with you when you say yoghurt make the texture of the cake better. I absolutely love your photos. You've decorated this cake so well! This looks amazing! Love the white choc chips all over. Beautiful and captivating pictures. The cake looks pretty. Good luck and best wishes to your sister and BIL. I wish I'd seen this post a few days ago, when I was looking for eggless recipes to make for cousins!! I usually dont bake anything eggless, but this is a very handy recipe to have, I'm sure!! I was shocked when I read the cocoa butter frosting, and got super excited and was just about to add it to my 'to make' list, when I saw that it was just cocoa and butter! Lol! I love how you decorated the cake! White chocolate is so under-appreciated!! thepurplefoodie: The title is quite misleading, I agree! The thought did cross my mind…. "cocoa butter" also has a different connotation. That was a great treat, to say the least. Simi: Yes sure looking forward to it! Come to think of it, this would be great made with cocoa butter. Just that I can't justify the purchase of an entire can of cocoa butter for a single cake. And worse still, it goes rancid pretty quickly. Yea, I'm back drooling over this very cake. j'aime vraiment ce genre de gateau et les photos sont térribles ! I have just ventured into egg-less baking.My mom is famous for her cakes but all are with egg. This was something new that we tried, but i think using icing sugar instead of Castor sugar for the icing would be better, as the Castor/powdered sugar does not come as smooth as icing sugar does.The cake turned out well though. I'm Gauri, daughter of Sadhana Rao from the boutique. I really have to tell you… you have inspired me a lot. I love your website with all the recipes and posts and pics too. I just love cooking since i was a kid and since mom told me about your website I've been hooked. I tried out all the cake recipes, the butterscotch pudding and also the spinach curry. I tried a pineapple wet cake with modifications of your vanilla cake recipe with natural pineapples on my birthday. Thanks a lot. I will keep trying the new recipes. Gauri: Hi..thank you so much. Your message has put a smile on my face. Look forward to your feedback and comments. Happy cooking and baking! You have a beautiful blog, and gorgeous pictures. never easy to bake without eggs, but you are doing a phenomenal job…WOW!! This is a beautiful cake! Deeba: Thanks. I never use eggs so I have no choice but to bake everything without them. Thanks for the wonderful recipe. I made this cake for my husband's b'day and he loved it. He asked me to make it again after a week and he is really picky abt what he eats, so i was so happy when he liked it. 2. while making the cocoa butter, make sure you mix it for a long time (atleast 10 to 15 min) to get the smooth texture like in the bakery. first time I made, i just mixed it enuf to combine the ingredients and the frosting came out really grainy. Pallu: I'm happy you and your husband liked this cake. But I wonder what went wrong with your 9" cake pan? I always use a 9" round pan with 2" height for this recipe and the cake fills and fits the pan beautifully. I have never felt the need to use 2 pans and so have many others who have made this recipe, so I'm wondering as to why you had to use 2 pans? Is it something to do with the height of your pan I wonder! Also, it has been my experience that If you use confectioner's sugar also known as icing sugar, you dont have to beat for so long to obtain a smooth texture. I was hunting for a eggless cupcake and I landed in your website. Can I use the same ratio for cupcakes. Do I have to add anything different. My son's birthday is coming and he wants to take cupcakes to preschool. As we don't eat eggs, I am in dilemma. This recipe is perfect. What about the timings? Raji: Yes you could use this recipe to make cupcakes. The batter would make around 12 cupcakes. You could bake them for 25 to 30 minutes depending on your oven and see if they are done. I have other eggless recipes for cupcakes here as well. I do not see this under eggless baking. Please add. I made this cake yesterday and it came out very well. Thanks for the recipe. Keep them coming! your cakes are superb…can we replace the yogurt with other ingredients. have a friend whose allergic to eggs….. i tried this cake yesterday for her…. was very short on time, hence no pictures…. must tell you that it was mindblowing n gave me the confidence that no-egg baking's possible n also comes out equally yummy…. came out splendid despite all my apprehensions…. Nachiketa: I'm glad you enjoyed this cake. All I can say is eggless baking is great on the taste and texture factor and less messier (without the eggs ;-))! Hope you continue to enjoy eggless baking. My best! hey…first time here….i see i have a lot of catching up to do….cake looks yummmy with the choc chips on top….bookmarked. i made this cake yesterday for my hubbys birthday! it was really tasty..this is the best eggless vanilla cake i've tried so far! my hubby liked it very much! I'm happy all of you are enjoying this cake. Will try and post a basic vanilla buttercream soon. I absolutely love your blog, especially the pictures you post with them. I've even shared it my sister. I love cooking new dishes and there's always something exciting on your blog. 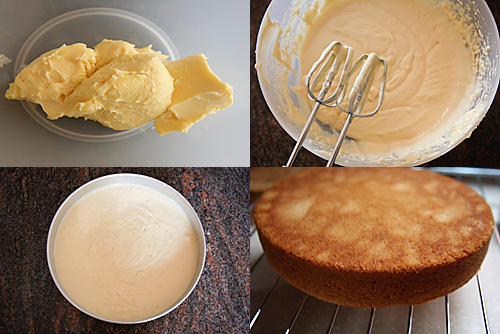 I want to bake your eggless vanilla cake and was wondering whether you use a fan-assisted oven? I've been told to reduce the temperature by 20degrees as well as the cooking time in my oven since it uses a fan…but I assume, if you use a fan oven then I don't need to change the baking time. Aqeela: Thank you for your lovely feedback. @Aqeela: I use a built in convection oven as well as an OTG. You can bake at the temperature specified above and you should be able to get the desired results. Could you tell me if I can use this buttercream frosting on cupcakes? Also, can you post the recipe for pizza sauce? And I can make cupcakes with this recipe right?? I made cupcakes today using this recipe! They turned out very very soft! Yummy! I baked at 350 F for 20 minutes. I got really confused initially cos the flour measurement was 225 gm (8 oz/ about 1 ½ cup + 2 tbsp). Now 225 gm=8 oz, which is fine, but 1 ½ cup + 2 tbsp is a lot more than 225 gms or 8 oz. I just went with 1 ½ cup + 2 tbsp. And it turned out fine. For the icing though, I used Trader Joe's Cocoa powder which I thought would be good.. but I didn't really like the taste. Could you please tell me which Cocoa powder should I use? I live in the US. I used Trader Joe's Alcohol free Vanilla Essence and it was awesome! Thanks for these lovely eggless recipes! NSJ: Ofcourse you can use this on cupcakes!Happy that you like my site! Will try and post a recipe soon…but there is a lot on my plate right now. Hope you will be patient with me. Thank you! NSJ: Great that you had success with your cupcakes. I don't know what size measuring cup you use, but 1 cup = 250 ml= 140 gm flour which is 1 1/2 cup = 2tbsp flour. It is best to use metric measurements while baking to avoid this confusion. I use unsweetened cocoa powder sometimes purchased locally and at time bought abroad. It is a personal choice and I suggest you experiment with a few to ascertain what you like best! Is it possible to substitute the 2 tbsp plain flour with 2 tbsp cocoa powder, to make a chocolate cake? That shouldn't affect the overall softness and texture of the cake, right? NSJ: You could definitely try it! It won't affect the texture or taste. If you do try it, let me know how it goes! Very interested in trying this cake but I'm a little confused by the some of the cake batter measurements since they are provided in metrics. Can you verify the amount of milk needed? 200ml and 3/2 cup are not equivalent. Also, 225 grams of flour is not equivalent to 1 1/2 cups plus 2 tbsp of flour. Thanks! hello again… i just want to ask if it is better to follow your metric conversions? You provide both but they don't seem to match up. So, I just want to know when you make your cake do you the 225 grams of flour or 1 1/2 cup plus 2 tbsp of flour? 225 grams of flour converts to approximately 1 cup. So, that is why I am asking. Same for the milk conversion. How much do you actually use? Erin: Sorry for not replying earlier. Somehow missed this! I use a standard 250 ml cup for measurements. And 1 cup of plain flour is approximately 140 gm. If you want to be absolutely precise and avoid confusion use metric measurements. And the same goes for milk. It is 3/4 cup milk which due to some technical error at the backend was showing as 3/2 cup. It is now rectified. Hope this helps! thank you for replying and for the clarification! Khushi: Sounds great! You can mail me your pictures. Would love to see them. Malti: This is actually a very foolproof recipe. Looks like your spring form pan is the culprit. Springform pan is best used for pies, quiches and cheesecakes as their base is usually thick. For a cake it is best to use a cake pan which has the same thickness on the base and sides. It is absolutely fine to use store bought yogurt. You can also skip it if you dont have it on hand and add milk instead as the quantity used here is very little. I have made this cake with yogurt and without it with equal amount of success. Am sure they must have liked it.Have to wait till evening to hear her verdict! Ive tried this recipie so many times without fail!! 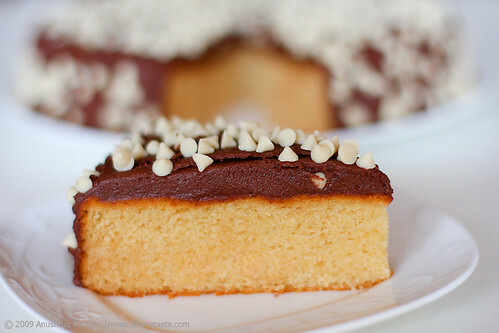 I love this recipe……the cake comes out soft and spongy everytime!! Good work! Lavanya: It is so heartening to hear that! Thank you for reporting your success with the cake. Malti: Great! I look forward to sharing more recipes with you too. Such words as yours just inspire me to keep going! Hi Anu,i am so excited to find all these wonderful recipes. I have been looking for eggless bakeing for yrs.haveing a vegetarian family who love sweet so much sometimes i dont find things to make esp cakes . thank u so much u r a blessing to us.love u and gods blessings to u and ur family.i live in guyana south america. simone: Nice to hear from you. Thank you for your kind words and wishes. Look forward to hearing more from you. Hi Anu,i made this cake yesterday for my mom`s birthday and it was perfect just like urs.every one loved it .it was moist and the taste was perfect,i had to bake another one.thank u so much anu keep up the good work. simone: Glad you and your family liked it! Swati: Yes you can…but you will have to keep it covered because this is not a moist cake. 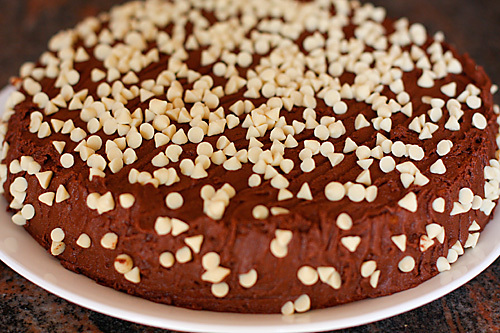 Eggless chocolate ganache cake, eggless pineapple cake are best suited for making a day in advance. Tried this recipe and loved it.Thanks for sharing all your fabulous recipes. Love all your dishes especially the cakes. I love this simple recepie and i just have one question…why do cakes sometimes peak at the centre…is it the size of the pan? Also, I wanted to check on the cheesecake…Can i use a silicon mould lined with an aluminium foil instead of the springform pan? Bhavana: Thanks for your kind words. Am happy to hear that you enjoy my recipes and writing. The cake can peak at the centre if the tin size is smaller than recommended or if it is very hot. You can use a silicon mould but I'm not a huge fan of the same though. I loved your cake recipe. i have a question however. I live in US and here i have full size oven. Can you please confirm that i will have to bake the cake for and hour at 180 degree?? cause i have seen all recipes baking at 350 F for 30 minutes. I am lil confused. Also i want to make this cake for my husband's bday and i have 9 inch pan and is this possible to bake this cake in 8 inch as i have been thinking like bake a high cake and decorate it.. otherwise i will be baking in 9' inch. Will baking in 8 inch pan will make it high in height so that tht will be look good for decorating?? Anjali: It doesnt matter where you live, you have to bake this cake at 150 C/ 300F as stated in the recipe for an hour. You can use an 8" pan if it is very deep. Good luck! I came to this site to thank you for this wonderful vanilla cake recipe. i made birthday cake for my husband. I had to use to 9 inch pans as batter was much more to pour in one and i am glad that i did this as both pans were full after baking. Cake was delicious, a must try to everyone. i made buttercream vanilla icing (using wilton recipe) and it was all perfect combo. *Sorry two 9 inch pans. A silent follower of your blog. I just wanted to let you know that I have tried every single recipe of yours with great success. I made this cake today and as usual it was greAt. I can't thank you enough. I just had one query. The frosting was a lil grainy.and I thought there was a strong sugar taste or feel to the frosting. Any fixes for the next time? Cuz am gonna make it again for sure. Nd my cake color was more on the brown side. Yours looks yellow. Do u think it's the ingredients? Sound and looks great. I am planning to bake this for my husband's birthday next week. I just want to use half the quantities and bake a smaller cake. How long should I bake in that case? Also, I want to bake it in the morning and give it to him that midnight. When should I frost it? Will it still taste fresh? The cake was very good, however adding this much butter seems to make it a little greasy. Also, baking it for one hour seems to make the sides and a portion of the top a little burnt. Maybe both of these should be modified? Anyway, it was a really good recipe. The cake was very light, which is one of the things I love in cakes. And it's only mildly sweet, which is very good as the icing provides all the sweetness, as it should. Anjali: You can use one 9" deep pan or two 9" regular pan. I use one 9" pan (2 1/2" in height) and it works fine. Glad you enjoyed this. Divya: Glad you enjoyed this cake. Your frosting was grainy because it looks like you used granular sugar. Use smooth icing sugar and you are good to go. The colour could be because of the butter or other ingredients like milk (cows milk is yellower) in it. Gayathri: You can use half the quantities. Just make sure you use a 6 or 7" round tin. Baking time would be anywhere between 40 to 50 minutes. Check the cake once after 40 minutes by inserting a skewer and if it comes out clean it is done. If not, bake for a few minutes more. On second thoughts, why not make this cake as is and distribute your husband's birthday cake to friends? You can frost the cake in the evening and don't worry it would still taste fresh. Foodaholic: This is a tried and tested recipe by me and also by others as you can see in the comments above. I don't find it greasy and if you don't bake the cake for an hour it would be undercooked. The cake would get burnt if the oven has unequal distribution of heat, if you bake it in the top rack or the temperature setting is inaccurate. If all these things are taken care of, an hour is just perfect for this cake to bake. My hubby's birthday was on 7th and I baked with the whole quantities. It came out great but for the thickness since I used a larger tin (I did not have a round one). There I go….. cut it into half and layered it with ur amazing frosting. It just tasted great. He loved it. I am grabbing another piece as I am wring this. Will surely try with other toppings too. Thanks a lot for ur efforts in putting them here in such a great way. Can you please post the recipe for a basic chocolate chip cookie? Seeing lot of them in various blogs but want to do yours. Gayathri: Sorry for the delay in replying to your message. I'm so happy that you and your husband enjoyed this cake. Will surely put up a chocolate chip recipe soon. There is a long cue of requests so I hope you will be patient. This looks absolutely delicious…could you also share a carrot cake recipe. Neha: Your request has been noted. I request you to wait for some time as I have a long list of pending recipe requests. I made this as first sweet for this diwali. almost half of the cake got over and all of us enjoyed every bit very much. thanks a lot for this. I am still gathering courage to try your pumpkin pie. will update u once i am done. thanks once again. Hey thanks for this awesome recipe..was lukin for sum new cake recipes n came across ur blog..i made the cake in the afternoon n its over by now..everybody jus loved it n i too loved bakin it..:):)thank u..it tastes awesome…keep up the gud work. Vasumathy & Megha: Nice to know that you'll made this for Diwali. I cannot thank you enough for such a gorgeous recipie. I followed your instructions to the T and the cake turned out just FANTASTIC!!!! You have given me so much hope as far as baking goes at a time when I had given up. 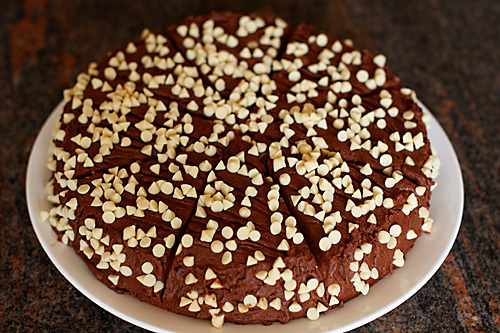 I am a vegetarian and always found it so hard to find an eggless cake recipie. I baked this last night and surprised my kids as they woke up today. They simply Loved IT! I messed up with the frosting a bit- I used castor sugar and the result was very grainy. Will use icing sugar next time. But it still tasted great! Do you have to wait for the cake to cool before frosting? Please clarify. Would you have a recipie for tender coconut pudding? Please do post it if you can. I just love your blog and am a huge fan of yours now! Keep up the great work! Thank you sooo much for a great recipe .. Tried out your eggless brownie recipe and they turned out to be wonderful. Its holiday time for me again and I am all set to try out another recipe of yours.But before i could try out this recipe, i'd just want to know,by how much should i reduce the ingredient quantity if i have a 6-7" round tin? This Cake does not have sugar? Is it because of the sweetened condensed milk? Sneha: Reduce the quantity to exactly half if you want to use a 6" round tin. Just baked and iced the cake for a tea party (my guests eat only satvik food) and now waiting (impatiently) for my guests to arrive. I did manage to taste the frosting and it was delish. Just tried the cake , the taste was superb but it was not soft more to compact any idea where I went wrong? Liza: Overbaking or using less fat than that mentioned in the recipe can make a cake hard. Which butter you have used ? Salted or unsalted? Can we use amul salted butter? The cake looks perfect! Not only cake recipe your cake's photography is also attractive one. I have not tried this recipe yet but Its very sure that I will make a similar cake of my own. The thing which attracts most in this recipe is chocolate buttercream frosting, It's a great idea to decorate cake. Nice share! I really praise God for you and your fabulous website. You won't believe, for the past one week I have been trying in vain various recipes for eggless cakes from various websites. Not a single one turned out fine. Finally I landed here and was awestruck. It is my husbands birthday this Sunday and I desperately wanted to bake an eggless cake for him as a surprise. From the time I have bought an OTG I haven't had any success in baking. But tonight is my first successful bake ever. Just took it out of the oven. Amazing colour and texture. Couldn't resist and tasted it while still warm. Tastes DELICIOUS. I know it is really late in the night but I wanted to somehow bake a cake for him. I am glad my search ends here. Now I can sleep in peace. Tomorrow I am going to bake another one in a heart shape mould and decorate it too. Thank you sooo very much. Long story short …I am too excited. Can't believe that I finally managed to successfully bake an eggless cake. I don't eat eggs/non veg and your website is just perfect for me. You are an amazing chef and a great writer. Love the spectacular clicks and the accurate and step wise recipes. Love the way you involve your family in each post. May you and your entire family and extended family be blessed abundantly. Once again thanks a ton. You made it possible for me !! Great to hear from you. Finally I baked two tasty cakes from my dear husband. Two because the first one sank !!. My mistake …opened the oven door too soon I guess and the rainy wind from the window was quite cold. …..these mumbai rains attacked my cake I told my husband. No problem though as I covered it up with the most delicious frosting ( made with your fab recipe again). The second one came out perfect and round…( didn't want to take any chances and stuck to your recipe to the T. So used a similar mould to the one in your pic). So nervous was I this time and kept pacing up and down. My kids were also equally excited and helpful to the core. We then decorated it in rose swirls and gems all around. ( wish to send you the pic so that you can give me your valuable feedback. Even the icing was done first time ever with no prior experience at all.) the end result was great. All of us enjoyed the cake thoroughly, specially the birthday boy !!!! My two daughters aged 7 10 were so thrilled …..and we also shared the cake with our church members. Have given them your website details and the frosting recipe. They too were amazed with the taste and texture especially the delicious frosting!!!! Now my two darling daughters also know how to bake a cake and ice them. They simply love your website and the lovely photographs. They want me to try the melting moments cookies recipe next. The three of us are addicted to this site. We now have a great site to browse during our spare time. Spending quality time together and bonding too while learning to cook/bake….what more can I ask. Thanks to all your hardwork and selfless sharing of the most amazing recipes. God bless you for sharing your talent ns knowledge and teaching us wonderful things online. You made our day. Take care and keep posting those fab recipes….THANK YOU !!!! Shirley, Jessica and Sheryl and the birthday boy. hi Anushruti. could i replace condensed milk with sugar and milk? im eagerly waiting for your response. Hi.i love ur blog and the photographs are really awesome. I tried ur strawberry cheesecake , it turned out great! ! I tried this cake also .initialy it rose well but after taking it out from oven it sank from middle..is it due to the reason that i use Spring form?? jigyasha: You can use use springform pan, but it needs to be of the right size. The cake will sink if the tin size is small. Madhavi: You will have have to bake this in many batches if you want to use a 6" tin or reduce the batter by less than half the quantity. Thanks a lot for the wonderful recipe! I'm planning to bake a cake for my parents' anniversary, however, I don't have a proper oven at home! Can you suggest something as a substitute? I have read about using a pressure cooker/microwave but just wanted to check if you had any idea. Hi Anushruti, I baked this cake yesterday..and it turned out beautiful. Soft, spongy and a very nice milk cake flavour. My family loved it. I'm sure the flavours will be a little more settled in the today. This recipe is definitely a keeper. Do share your tried and tested variations. Would love to hear about them. Thanks for sharing. Swati- Glad that you enjoyed this recipe. I do have a recipe for a very nice orange cake on this site. Check it out! I would like to make this cake for my sister's birthday but I have a few questions. 1) Can this cake be baked in a 10" x 3" round removable bottom cake pan? 2) If I need this cake for Tuesday evening, when do I have to bake it in order for it to cool enough to ice it. Will the cake remain moist if it is baked the day before? 3) I would appreciate it if you can specify correct measurements. MARIE LALL- 1. Yes you can make this cake in a 10" pan, but the height of the cake will be lesser than when you bake with an 8" pan. How can I make simple cupcakes? Richa- You need to beat until the batter is mixed, not more than 3 to 4 minutes. I tried this cake. It was very tasty but the frosting was a bit grainy. I mean when we took a bite of the cake, it seemed as if the powdered sugar had not blended well with the other ingredients. Can you please suggest why this might have happened and how to ensure a smoothness in the texture of the frosting? P.S. I used powdered sugar and not icing sugar. Poonam- You need to use icing sugar or confectioner's sugar for a smooth icing. If you sieve the icing once to remove lumps and blend well with the butter, you will have a smooth icing. I made this cake.It was very tasty.But the cake rose up the upper portion whereas the lower side was thick like halwa. I made it in a gas oven .I d like try again . Can pls tell me were I went wrong. I followed your recipe to T. Thank you. Rathy- If you bake in a convection oven, it heats the cake from all sides and it will be properly cooked. Vaishali: Thanks for the feedback. Your cake recipes are simply Awesome! They never fail :). Thanks for such lovely recipes. However I would like to know whether we can make it with Glutenfree Flour. I would like to know if we can prepare Glutenfree Flour at home and how? Yes, you can use gluten free flours like amaranth to make this cake.